The Texas Department of Licensing and Regulation have addressed the controversies stemming from Saturday’s “Strikeforce: Houston” event in The Lone Star State. 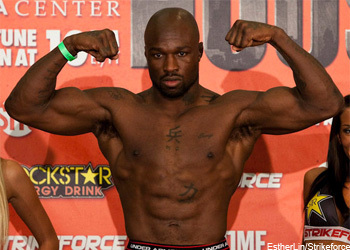 Susan Stanford, the TDLR’s public information officer, today told MMAJunkie.com that Muhammed “King Mo” Lawal and K.J. Noons did not break the rules by inhaling TRUO2 Portable Oxygen Cans shortly after taking the stage. The canisters, who was first brought to our attention by MiddleEasy, supposedly maximize power and explosiveness, while increasing endurance and stamina. Some media outlets have suggested the bursts of oxygen could fall under the “performance enhancing” category, however it appears both fighters received the go ahead prior to ingesting the substance. The controversy carousel didn’t stop there, as the TDLR was forced to answer questions regarding the dubious officiating that went down inside the Toyota Center as well. Lightweight KJ Noons dropped Jorge Gurgel a split-second AFTER the 1stRound horn sounded. Although the left hook was far from an intentional cheap shot, it left Gurgel seriously dazed and confused nonetheless. Some have suggested that a No Contest should have been considered since the unfortunate strike clearly played a factor in the ease in which Gurgel was put down just moments later. Furthermore, former WWE star Bobby Lashley was handed his first pro MMA loss after his referee asked the cage-side doctor to examine the cut near Lashley’s left eye while he was in a dominant top position. Fortunately for Chad Griggs, the fight was auspiciously restarted in the stand-up position after it was deemed Lashley could continue. Not much was made of it at the time, as there were only 45 seconds remaining on the clock, but apparently that was all the time left in Lashley’s undefeated status. Referees are allowed to restart athletes on their feet if there is a lull in action. However, I can’t recall the last time a fighter in full mount was forced to let his opponent up for inactivity. Based on the intensity in which Lashley was sucking wind after the 2ndRound, it’s likely it wouldn’t have mattered.